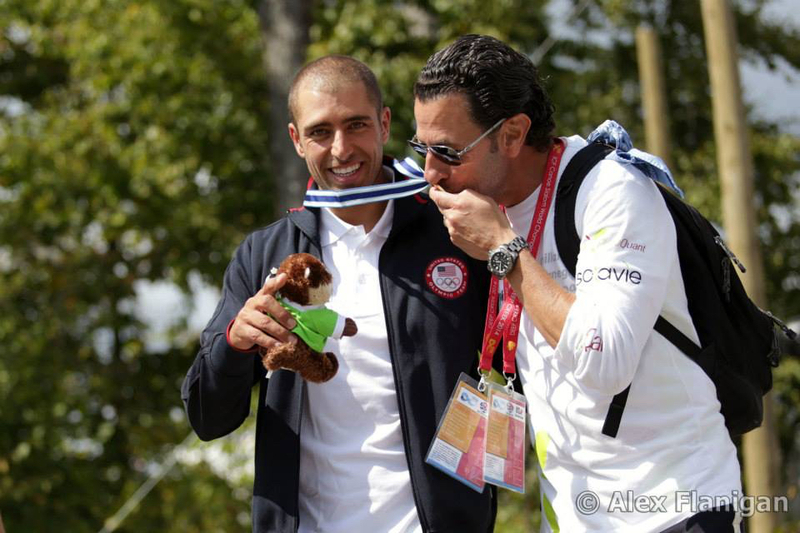 On Deep Creek Lake Basin, Maryland, Lefèvre surprised even himself: “I did imagine winning gold in C1 so quickly. In the past two years I have only spent 50% of my training to this category.” He has been representing the United States since 2013 and has earned his adopted country its first world title since 1995. “I have realized a childhood dream. Now I’m the best paddler in all categories,” he said. 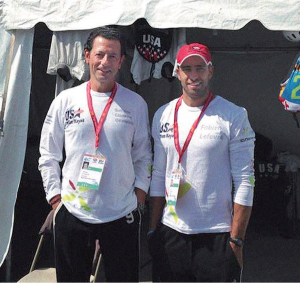 To his credit, he previously won K1, the single kayak, as well as two Olympic medals (silver in 2008 and bronze in 2004) and two world titles in individual (2002 and 2003). “After that I received those two titles it was my great achievement. My first world title (in 2002 Bourg Saint-Maurice) was top, but now (what I just won) it’s even more powerful,”, he exclaimed. Before becoming the first to achieve the double C1 / K1 at the World Championships Lefevre, 32, indeed “started from scratch.” After his failure to qualify for the Olympics in 2012 – following his failures in the selection races and after the departure of his coach – he had embarked on a new challenge by moving with his wife and two children to Bethesda, Maryland near Washington DC; then working to integrate into an American team he was at the trough of a wave. Fabien, How have you managed your preparations for these “Worlds” in your new country? FABIEN: After my arrival here in the US, I endured a long tumultuous time, emotionally and psychologically. I had zero visibility, was enshrouded in fog and needed time to accept the letting go of old beliefs. It was necessary to question myself, to learn to accept the new, and better understand the fears and anxieties associated with this period of transformation in my life. The US system allowed me to choose mindfully those stakeholders who I wanted to work with to start my new career, and to evolve in my personal growth. The US team and all its staff respected my choices and the training methods taken with my performance. Something that had been impossible before. It is a pleasure to evolve here in the USA! FABIEN: There are two important people, with whom I work in total confidence and have a access carte blanche. First, I have worked for several years with Laurence Damiens, who is a coach and art therapist. This long-term work allows me to sink deep into myself and find the relevant tools to enhance my performance. Laurence allows me to explore myself with a real personal approach to research and learning itself. She actively supports me in my career and remains in contact until the competitions. All that has allowed me to build a strong household, a stable foundation to create a favorable living environment, here in my new sports homeland. And the second person? He is here with you today. FABIEN: Guillaume Caunègre has been working closely with me all season. He has played a very important role in my performance and I feel fortunate to have had the chance to meet him. As Osteopathy is not as well known here in the US, he has not had as much chance to practice his abilities at the highest level in the United States. Which is ironic because Osteopathy was born here! FABIEN: His therapeutic experience is extensive. First, he has 25 years of high level experience in sport, and also because he guides me on all aspect of physical, nutritional, and mental energy. It was through him that I met Nicola Frassanito, President of the PhytoQuant Laboratory of food supplements, which sponsor me now. We share the same human and spiritual values. On this beautifully synchronistic meeting I hang my medal. Guillaume helps me discover deeper bodily and mental awareness. Through him I find energy sources where I can access what is needed to enhance my performance. We worked closely for 5 months on a health management level, with careful adjustments on bio-mechanics, physiology and metabolism. Despite 15 years of osteopathic work in France, with Guillaume my level of results started rising to a crescendo. He performs fewer joint manipulations, the result being that my body is more durable and my muscles and tissues stronger, which allows me to do more with less pain. I am able to increase my resistance workouts and push myself harder. I push my body longer and harder than ever before. You were talking about nutrition? FABIEN: Yes, indeed, and micro-nutrition. Guillaume developed a customized program for the year, involving all my trainings, and each competition with PhytoQuant food supplements with whom he has been active for 10 years. He plans my entire diet, and though it may not be fun, it is still good for me. For example, 9 days of preparation and competition at the World Championships, he made all my meals from morning to night, with organic foods filled with energy, all while adapting my meals specifically to the kayaking events as well as canoe. He managed the taking of chlorophyll, magnesium and other supplements very precisely to maximize muscle performance, endurance and recovery. We achieved an optimum performance level mentally and physically. The result is gold! This level of excellence also results in my being able to listen to and understand the stress on my body and mind when I train two to three times a day. It was especially helpful in a hyper-cold winters like we had this year, when I was out on the water everyday, with wind and snow everywhere. And you Guillaume, are there any secret ingredients in your recipe to producing champions? GUILLAUME: I do not make anything, I only help to develop. It is a true holistic approach. There are secrets of course! But I cannot reveal the technical details and Chronobiology that makes the final dish! This is between me and Fabien! Each training program is custom delivered with the athlete and remains unique. This does not change, these are my principles of overall care – body, spirit, energy and intentions. Food supplements I use make a big difference in the sense that they amplify the results of my work and stabilize the effects on the body, concentration and even motivation and moods. I know how these products are made, I know the provenance and quality of all their ingredients and is largely above the rest of the equivalent labs in quality and efficiency. We must also understand that behind the athlete, it takes an intelligent person, open and ready to accept challenges to achieve success. It is not for everyone. Fabien is part of a small group of elite champions who able to work deeply and forego what they know to try something new. The program we worked on together was a great example of cooperation, closeness and great joy, both in preparation and in success. FABIEN: I would add that our days at the World Championship Days were full. When we woke up, we’d first warm-up my muscle, doing yoga and specific meditation techniques. We’d also focus on diet, mineral supplements, vitamins and minerals, then we’d do exercises and osteopathic techniques on and around the course and the pool, as well as mental visualization techniques, and more … I was given a specific program adapted to each day’s needs, with workouts, from morning to night, culminating in races on the weekend. My body was prepared as a temple in the service of my mind, my foundation of preparation was strong and the icing on the cake for these nine days was the gold medal. Our commitment was an alchemy of resources, everything focused on letting go and going with the flow. Before the event, nothing was left to chance. And then I’d paddle out of the starting gates upstream, everything else would disappear, I would let go, and what occurred was magic. I have experienced these perfect states of being rarely in my 12 years of competition. It was a state of total and absolute presence.